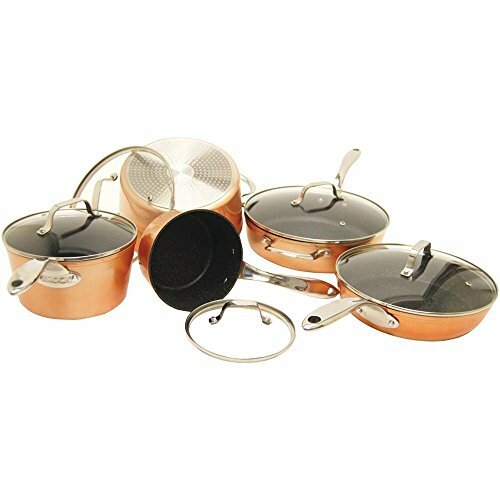 Add the warmth of copper to your kitchen with THE ROCK by Starfrit 10-Piece Copper Cookware Set. This collection features the same great performance you have come to expect from THE ROCK by Starfrit thanks to Rock.tec technology. This technology uses tiny steel pellets to harden the aluminum creating a rock-like surface with peaks and hollows on the surface of the pan. These dimples create air pockets under the food, so the food does not have a flat surface to stick on. The result is an unparalleled nonstick performance. This rock-like surface is also highly scratch-resistant, allowing the use of metal utensils. The cast stainless steel handles are oven safe up to broil, giving you the utmost flexibility. The collection goes from stovetop, to oven, to table to dishwasher.